Thucydides (or Thoukydides) (c. 472 BC – c. 400 BC) was an ancient Greek historian, author of the History of the Peloponnesian War, which recounts the 5th century BC war between Sparta and Athens. This work is widely regarded a classic and represents the first work of its kind. 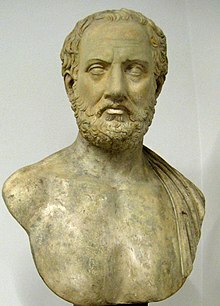 Thucydides, an Athenian, wrote the history of the war between the Peloponnesians and the Athenians, beginning at the moment that it broke out, and believing that it would be a great war, and more worthy of relation than any that had proceeded it. Variant translation: "...the search for truth strains the patience of most people, who would rather believe the first things that come to hand." Translation by Paul Woodruff. Variant translation: "People always think the greatest war is the one they are fighting at the moment, and when that is over they are more impressed with wars of antiquity; but, even so, this war will prove, to all who look at the facts, that it was greater than the others." Translation by Paul Woodruff. For the true author of the subjugation of a people is not so much the immediate agent, as the power which permits it having the means to prevent it. It is a common mistake in going to war to begin at the wrong end, to act first, and wait for disaster to discuss the matter.
" war is a matter not so much of arms as of money,"
self-control contains honour as a chief constituent, and honour bravery.
" the freaks of chance are not determinable by calculation." Variant translation: "Instead, we think the plans of our neighbors are as good as our own, and we can't work out whose chances at war are better in a speech. So we always make our preparations in action, on the assumption that our enemies know what they are doing. We should not build our hopes on the belief that they will make mistakes, but on our own careful foresight. And we should not think there is much difference between one man and another, except that the winner will be the one whose education was the most severe." Translation by Paul Woodruff. Variant translation: "There is no need to suppose that human beings differ very much from one another: but it is true that the ones who come out on top are the ones who have been trained in the hardest school." Note: Some versions omit the "who have been". Variant translation: We must realize, too, that, both for cities and for individuals, it is from the greatest dangers that the greatest glory is to be won. As translated by Rex Warner (1954).
" he who voluntarily confronts tremendous odds must have very great internal resources to draw upon." The country on the sea coast, now called Macedonia, was first acquired by Alexander, the father of Perdiccas, and his ancestors, originally Temenids from Argos...The whole is now called Macedonia, and at the time of the invasion of Sitalces, Perdiccas, Alexander's son, was the reigning king.
" we know that there can never be any solid friendship between individuals, or union between communities that is worth the name, unless the parties be persuaded of each others honesty,"
" Now the only sure basis of an alliance is for each party to be equally afraid of the other;"
Book III, 3.22-- (See also: Spoofing attack..). Book III, 3.37- (Speech of Cleon..). The fate of those of their neighbours who had already rebelled and had been subdued was no lesson to them; their own prosperity could not dissuade them from affronting danger; but blindly confident in the future, and full of hopes beyond their power though not beyond their ambition, they declared war and made their decision to prefer might to right, their attack being determined not by provocation but by the moment which seemed propitious. The truth is that great good fortune coming suddenly and unexpectedly tends to make a people insolent; in most cases it is safer for mankind to have success in reason than out of reason; and it is easier for them, one may say, to stave off adversity than to preserve prosperity. Book III, 3.42- (Speech of Diodotus..).
" still hope leads men to venture; and no one ever yet put himself in peril without the inward conviction that he would succeed in his design." " we must make up our minds to look for our protection not to legal terrors but to careful administration." Words had to change their ordinary meaning and to take that which was now given them. Reckless audacity came to be considered the courage of a loyal ally; prudent hesitation, specious cowardice; moderation was held to be a cloak for unmanliness; ability to see all sides of a question, inaptness to act on any. Frantic violence became the attribute of manliness; cautious plotting, a justifiable means of self-defence. The advocate of extreme measures was always trustworthy; his opponent a man to be suspected. To succeed in a plot was to have a shrewd head, to divine a plot a still shrewder; but to try to provide against having to do either was to break up your party and to be afraid of your adversaries. That war is an evil is a proposition so familiar to every one that it would be tedious to develop it. No one is forced to engage in it by ignorance, or kept out of it by fear, if he fancies there is anything to be gained by it. Let him remember that many before now have tried to chastise a wrongdoer, and failing to punish their enemy have not even saved themselves; while many who have trusted in force to gain an advantage, instead of gaining anything more, have been doomed to lose what they had. Vengeance is not necessarily successful because wrong has been done, or strength sure because it is confident; but the incalculable element in the future exercises the widest influence, and is the most treacherous, and yet in fact the most useful of all things, as it frightens us all equally, and thus makes us consider before attacking each other. They stood where they stood by the power of the sword. "We hope that you, instead of thinking to influence us by saying that you did not join the Lacedaemonians, although their colonists, or that you have done us no wrong, will aim at what is feasible, holding in view the real sentiments of us both; since you know as well as we do that right, as the world goes, is only in question between equals in power, while the strong do what they can and the weak suffer what they must." "here we bless your simplicity but do not envy your folly." Men do not rest content with parrying the attacks of a superior, but often strike the first blow to prevent the attack being made. they possess most gold and silver, by which war, like everything else, flourishes. Contempt for an assailant is best shown by bravery in action.
" the Thracian people, like the bloodiest of the barbarians, being ever most murderous when it has nothing to fear." Right or community of blood was not the bond of union between them, so much as interest or compulsion as the case may be. And the rarest dangers are those in which failure brings little loss and success the greatest advantage. Book VII, 7.71- (See also: Fog of war..). In a democracy . . . someone who fails to get elected to office can always console himself with the thought that there was something not quite fair about it. In the Richard Crawley translation, this quote is rendered as follows : [U]nder a democracy a disappointed candidate accepts his defeat more easily, because he has not the humiliation of being beaten by his equals. (1) "A nation that makes a great distinction between its scholars and its warriors will have its laws made by cowards and its wars fought by fools." (2) "Of all manifestations of power, restraint impresses men the most." Popularised by Colin Powell, this quotation is not found anywhere in Thucydides. It comes originally from the 19th-century author F.B. Jevons, in his book A History of Greek Literature: From the Earliest Period to the Death of Demosthenes, writing about prose style; it was then quoted, without attribution, by classicist Charles Forster Smith, including in the introduction to his Loeb translation of Thucydides, which probably explains why later readers thought he was actually quoting from Thucydides. (3) "History is philosophy teaching from examples." This is an ancient misattribution: it appears in a third-century Ars Rhetorica attributed to Dionysius of Halicarnassus: "The contact with manners then is education; and this Thucydides appears to assert when he says history is philosophy learned from examples" (XI.2). 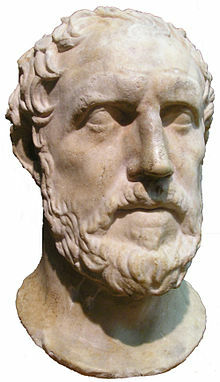 The phrase appears nowhere in Thucydides; it might be interpreted as a response, by an unknown admirer of Thucydides, to the argument of Aristotle (Poetics 1451b11) that history is inferior to poetry because it deals only with the particular, "what Alcibiades did and suffered", rather than the general. (4) "Justice will not come to Athens until those who are not injured are as indignant as those who are injured." This is often attributed to Thucydides (and sometimes, in a slightly different form, to Benjamin Franklin), but it actually comes from ancient accounts of the life of Solon, for example in Diogenes Laërtius' Lives of Eminent Philosophers I.59 and Plutarch's Solon 18.5. (5) "Peace is only an armistice in an endless war." Popularised by the movie Wonder Woman, where the line is spoken by general Ludendorff and 'recognised' by Diana as coming from Thucydides. It is not found anywhere in Thucydides; it does resemble a line in Plato's Laws, discussing the customs of the Cretans: "“Peace,” as the term is commonly employed, is nothing more than a name, the truth being that every State is, by a law of nature, engaged perpetually in an informal war with every other State" (Laws 626a). (6) "A collision at sea can ruin your whole day." Ascribed to Book IX, which is a clue that it's a joke as Thucydides wrote only eight books. This was invented by a student at the US Naval War College in 1960, and then quoted as a genuine line from Thucydides in the Reader's Digest in 1962. This day I finished Thucydides, after reading him with inexpressible interest and admiration. He is the greatest historian that ever lived. The importance of the Peloponnesian War for our purposes is obvious. First, it—on Thucydides’s account of it—exemplifies the strengths and weaknesses of democracy in ways that every succeeding age has seized on. On the one side, the resourcefulness, patriotism, energy, and determination of Athens were astonishing; on the other, the fickleness, cruelty, and proneness to dissension were equally astonishing. (…) Second, it reveals one major reason for the ultimate failure of the Greek states to survive the rise of the Macedonian and Roman empires. Greek city-states were conscious both of being Greek and of their own narrower ethnicity: Athenian, Theban, Spartan. ↑ Sharlin, Shifra (Summer 2004). "Thucydides and the Powell Doctrine". Raritan 24.1: 12-28. ↑ Jevons, Frank B. (1886). A History of Greek Literature: From the Earliest Period to the Death of Demosthenes. London: C. Griffin & Co.. pp. 340. ↑ Smith, Charles F. (translator) (1921). Thucydides Volume I. Cambridge MA: Harvard University Press. pp. xvii-xviii. ↑ a b Morley, Neville (2013). "Thucydides Quote Unquote". Arion: A Journal of Humanities and the Classics 20 (3): 9–36. DOI:10.2307/arion.20.3.0009. ↑ Morley, Neville (4 June 2017). Talk Thucydides To Me. The Sphinx. ↑ O'Toole, Garson (21 November 2010). A Collision At Sea Can Ruin Your Entire Day. Quote Investigator. The Landmark Thucydides, Edited by Robert B. Strassler, Richard Crawley translation, Annotated, Indexed and Illustrated, A Touchstone Book, New York, NY, 1996 ISBN 0-684-82815-4.